The Reversible Hard Maple Cutting Board from John Boos & Company hooks to any counter edge, putting an end to the slipping and sliding so common with simple flat designs. 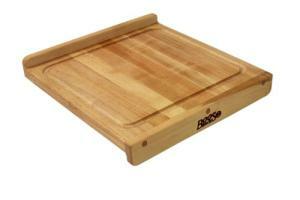 One side features a routed gravy groove to catch runoff from juicy meats, fruits, or vegetables. Nearly 24" long, the 17.25" width allows plenty of working room, and the 1.25" thickness gives the board enough weight for stable chopping. The board comes pre-oiled and the rich look of darkened maple will beautifully accent any kitchen. John Boos boards and butcher blocks are chosen for the sets of many celebrity chef cooking shows, for both decorative and functional reasons. Since 1887 this American firm based in Effingham, Illinois, has been the mainstay butcher block provider of fine restaurants, butchers, and even the kitchen of the White House. To maintain this fine accessory, give it a complete rub down with mineral oil every few weeks. If the color lightens and the board looks dry, it needs oil. After use, clean it with soapy water, rinse clean, and dry the wood with a paper towel. Air drying is essential to extend the lifetime of your Boos board. To eliminate stubborn odors like onion and garlic, spray the board with diluted vinegar or even lemon juice. This board will last a lifetime with proper care, but is not dishwasher safe and can be damaged by immersion in water (don't leave it flat on a wet counter--prop it up on edge to dry).